Before you can register a group or organisation you need to register as an individual. 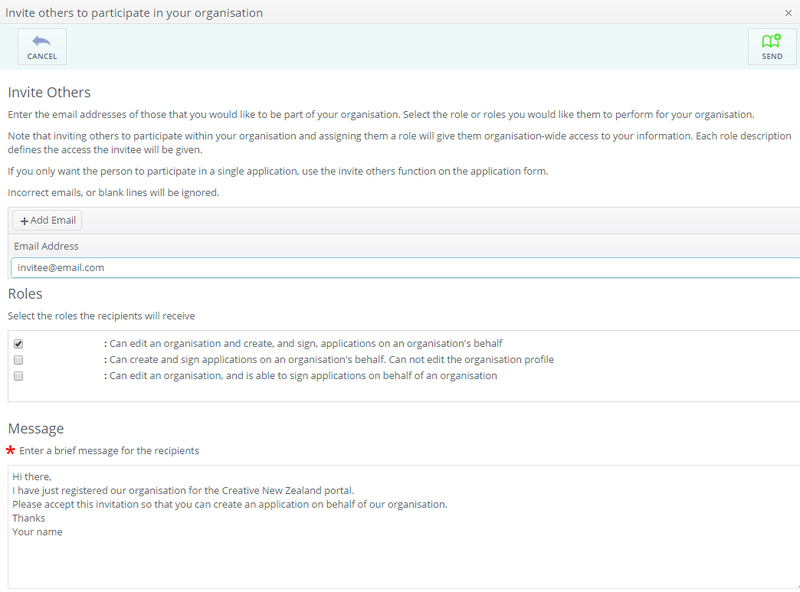 If your group or organisation has applied previously you can ask Creative New Zealand to complete the registration process and give you access to the group or organisation's profile in the portal. Note that inviting someone to join your organisation in the portal will not automatically allow them to view all applications from that group/organisation. See Invite others to join your application. Click your name in the top right-hand corner of the screen. The 'My Details' tab will open. Scroll down to the 'Organisations' section. Enter the organisation/group's details and click 'Accept'. A message will pop up. 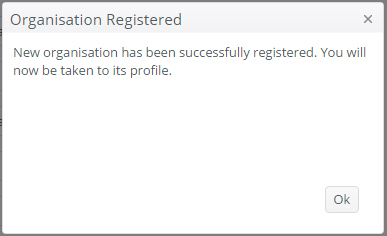 Click 'OK' to be taken to the Organisation's Profile'. Complete the profile and communication details for the organisation/group. Scroll down to the Contacts section and click '+ Invite Others' to invite other individuals to the organisation. Click '+ Add Email' to enter the email address of the invitee. Click '+ Add Email' again if you want to send more than invitation at a time. Select the roles you are inviting them to accept. 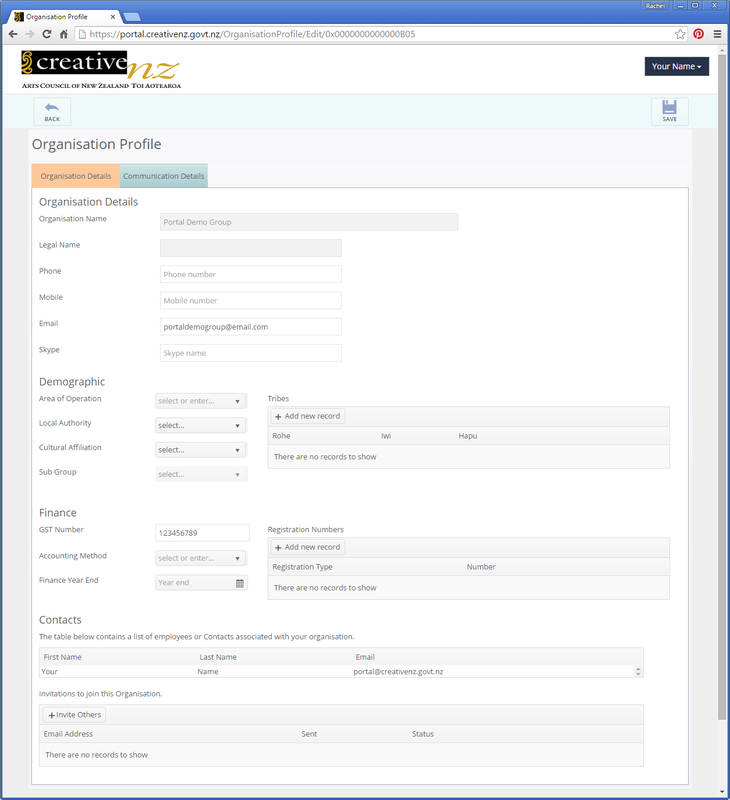 The first option gives the invitee full permissions to manage the group/organisation's profile, create applications on behalf of the group/organisation and sign applications and contracts on behalf of the group/organisation. The second and third options are restricted roles. Enter a message for the invitee/s so they know what the invitation is for. The invitee(s) will receive an email inviting them to join your organisation in the portal. If they haven't used the portal yet they will need to register as an individual before they accept the invitation. You will see the invitations waiting to be accepted in the 'Invitations to join this Organisation' table. Click 'Revoke' or 'Edit' to change the invitation. Once the invitee/s accept the invitation their details will appear in the list of Employees or Contacts associated with your Organisation/Group.